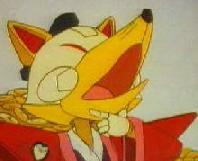 The name of the Japanese version of the Samurai Pizza Cats is Kyatto Ninden Teyandee. The easiest way to refer to it, to distingish it from the Pizza Cats, would be to call it Cat Ninden. The word Kyatto (cat, obviously) is written with the kanji for surprising group. Ninden is short for Ninja Densetsu, meaning Ninja Legend, and Teyandee more or less translates into What the &*^#@ are you talking about?! and is yelled at one's opponent before battle. The name of the restaurant, the Pizza Cat is supposed to be pun on Pizza Hut. The city they defend is called Edoropolis, where Edo was the old name of Tokyo. The city is a mixure of high and low tech. You'll notice many houses that look like old style Japanese houses, but with satellite dishes. The population consists of mechas (robots) who can grow up and age. The cats are called the Nyankee, a cross between Yankee and Nyan, the Japanese word for meow. The most noticeable things were in the scence where Guru Lou first appears. When he flips though the air he lands grabbing Polly's breasts and Speedy's dragging him by his foot causes him to trip and flush himself down the toilet. Speedy's name is Yattaro where, Yattaro means I'll fight you!, and taro is a common male name ending. Leader of Nyankee, waiter/deliverer for the Pizza Cat. Weapons: shurikens and sword, uses a hidden second sword when he becomes angry and uses his secret weapon, the Cat's Eye Slash. Has a crush on Mi-chan (Lucille). Guido's name is Sukashii which means show-off. Polly's name is Pururon, which is the sound of purring. The Big Cheese, who is a fox, is called Koun-No-Kami. Kami is a titel for a feudal lord, and a fox is in Japanese legends the epitome of cleverness and evil. Page last modified on 11-26-1995, send comments to Patrick Atoon. These Samurai Pizza Cats pages were not made by Saban International. Any opinions depicted here are not theirs, but of the creators of these pages. Original animation © 1990 Sotsu agency, Tatsunoko Production Co, Ltd. Images and audio © 1991 Saban International Services, Inc, Saban International N.V.